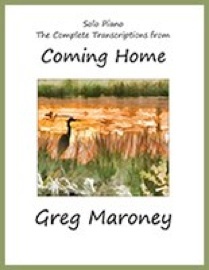 Coming Home is the companion songbook to Greg Maroney’s 2014 solo piano recording with the same name. All fifteen tracks from the recording are included. Greg did the transcriptions and I edited, getting the sheet music as close to the recorded versions as possible. One of the things I especially like about both the recording and the songbook is the variety of musical styles. From the more turbulent “After the Storm” to the gorgeous and heart-tugging “When It’s Gone” to the tender “Linda’s Smile” to the lively and playful “The Cat and the Cricket” and Greg’s haunting arrangement of “Shenandoah,” there is truly something for everyone here. The book is spiral-bound (yay!!!) and has a full-color version of the beautiful album cover on the front and the original photo the cover came from on the back - a beautiful book inside and out! The layout is clear, roomy and easy to read and the music is well-marked with dynamics and metronome settings. 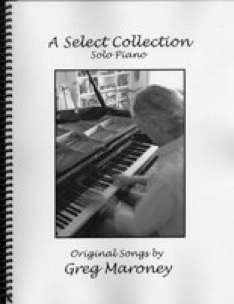 If you’ve played Greg’s other books, you know that he likes to compose in key signatures with lots of sharps, but there are also plenty of songs in easier keys. There are a few chords with a reach of a ninth, but not many (pianists with smaller hands can roll those!). Several of the songs are at an upper-intermediate level and others are more advanced, offering students the instant gratification of being able to play some of the songs right away and growing into those that are more difficult. 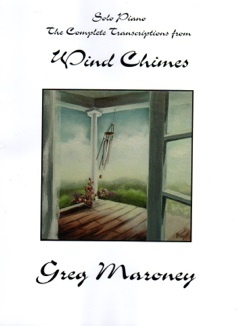 I think this is my favorite of Greg Maroney’s songbooks so far and I give it my highest recommendation! 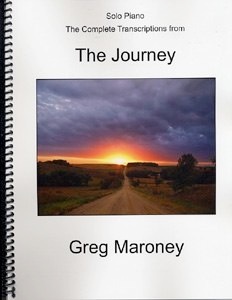 It is available from GregMaroney.com.